I’m a die hard lover of home scents and good candles. They help change the mood of a room and during the holiday there are all kinds of great seasonal options to make the house smell like Christmas. I’ve rounded a few picks of what I think are the best holiday candles and gifts for the home. If you have any favorites you like to burn during the holiday season let me know in the comments below! The holiday season would not be complete for me without Diptyque. I’ve bought the seasonal pine scent each year and this is the first year I’ve felt their pine is a bit different with a minty green touch to the scent. They have three seasonal candles with colored wax, a black jar in a cosmic theme with gold magical creatures on the exterior. It’s really just so beautiful! I bought the Cosmic Seasonal Candle Trio ($105 to $210). You can also find these individually although the orange one has pretty much sold out everywhere. Unicorn Frosted Forest Scented Candle is fir with a hint of mint and hinoki, Feu d’Argumes/Fiery Orange Dragon is a warm smoky orange clove and Larmes d’Encens/Incense Tears Phoenix with incense, cinnamon and myrrh. All three are phenomenal this year. There is also the 10 piece Mini Candle Collection ($150) which makes for the ultimate luxury home gift. It’s the best way to sample a lot of Diptyque in a more affordable way than buying each one individually. Burn time is quick on these but it’s long enough to get a good sense of what they smell like when burned. Antica Farmacista has some of the most elegant holiday sets. I just discovered them last year and love their diffusers. After writing about them last holiday I discovered that many of you have loved this line for years! Their Silver Cedar is a holiday release this year and it has everything I love for holidays: cypress, sandalwood, spruce and juniper in the most elegant combination ever. They’ve also brought back the Champagne Black Label which is the best sparkling sweet champagne scent I’ve ever tried. I have used this in the candle, room spray and diffuser and love it. All of their gift options here. You can find products directly from their website Antica Farmacista and also at Nordstrom. Shown below is the 100 ml Diffuser Trio ($64) with Silver Cedar, Champagne Black Label and Sandalwood Amber and their Candle Set with Silver Cedar, Champagne Black Label ($98) and a gorgeous wick trimmer. The diffusers are perfect for the guest bathrooms! They come beautifully boxed. 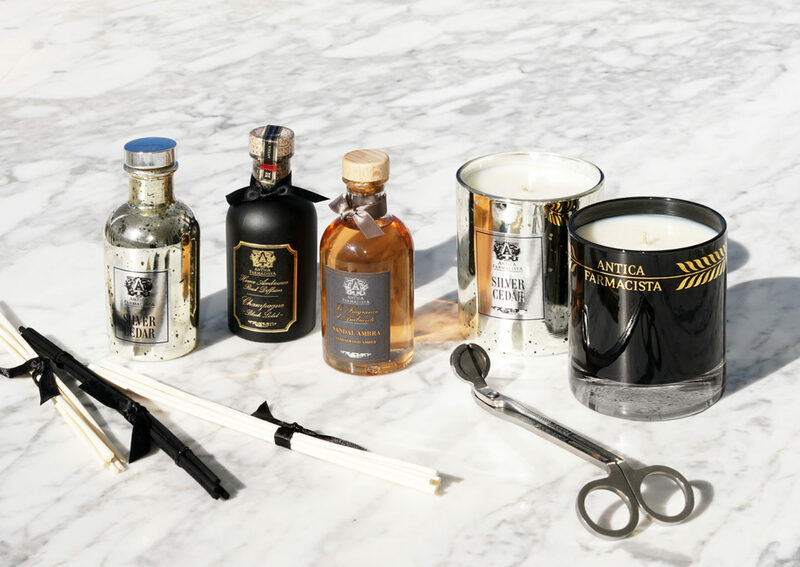 This year they also launched a gorgeous 12 Days of Antica Calendar ($175) with deluxe sized minis of their candles, diffusers, body products and a wick trimmer as well. I can’t think of a better luxury home gift than this set. Molton Brown is also another favorite line. My favorite scent for any time of year is the Coco and Sandalwood 3 Wick Candle and Home and Linen Mist, but for the holiday they always have fun limited-edition launches. I was able to try the Vintage With Elderflower Candle and it’s such a lovely sweet holiday scent. It has grapefruit, mandarin, elderflower, petigrain, coriander, vetiver and ambergris. If you like something on the sweet side but not candy sweet this is a beautiful sweet citrus option. I’ve been burning it for the past few hours as I’ve been putting this post together and it’s definitely lifted my mood with a bit of energy. Other holiday scent options on their website as well including Fabled Juniper Berries and Lapp Pine along with their classic Festive Frankincense and Allspice. That wraps up this year’s holiday gift guide for the best candles I’ve found. There are tons of great options and individual options from so many brands. I find that my top three brands year over year are Diptyque and Molton Brown, and Antica Farmacista has been added to the mix. If you’re looking for more affordable holiday options that still have amazing throw with a luxury vibe, Nest is a great line to check out. I also really like the Henri Bendel candles as well. One that isn’t new is Cire Trudon Ernesto which is probably the best luxury scent for the home, my husband smelled it for the first time right when we moved to Florida and said “that’s what we should burn all the time.” It really is phenomenal and I need to repurchase it at some point soon. There are a number of new ones out for holiday which I was really tempted to order, but given the price and the fact that I’m not that familiar with the entire line, I feel like they are something I need to smell first before buying – especially since part of me thinks it might not get better than Ernesto. I usually include something from Jo Malone and I do think their Pine and Eucalyptus Candle is a classic. This year they have a gorgeous one with a green label for holiday. I was debating whether or not to buy it (I usually do every year) but with the Florida sunshine combined with our travels this month I wasn’t sure I would have time to burn it before Christmas and I usually feel pine is best done in November/December. I skipped it this year. P.S. Don’t forget to check out this week’s giveaway! You can also enter via the Rafflecopter Widget below. Press samples featured from Molton Brown and Antica Farmacista.